While many of Earth were gazing up on October 8, 2014 to catch the total lunar eclipse, NASA’s Messenger space probe was also watching. It used the on-board narrow angle camera – from its far away station, in orbit of the planet Mercury to capture the eclipse. 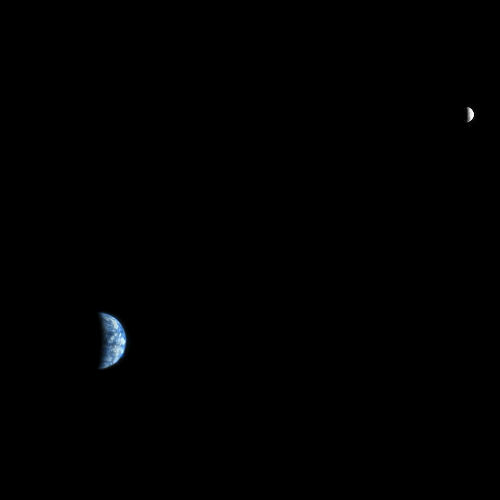 The picture of the left shows the normal view of the Earth and Moon from Mercury (two very bright points in space about 107 million kilometers away). During the lunar eclipse, the Moon disappears from view on Mercury as it makes its passage through the Earth’s shadow (as seen on the right). 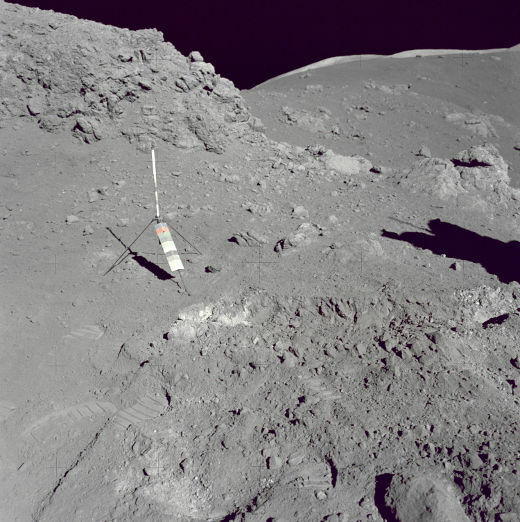 NASA’s Gravity Recovery and Interior Laboratory (GRAIL) included two lunar probes (Ebb and Flow) that orbited the Moon’s poles to collect data on its gravity field. 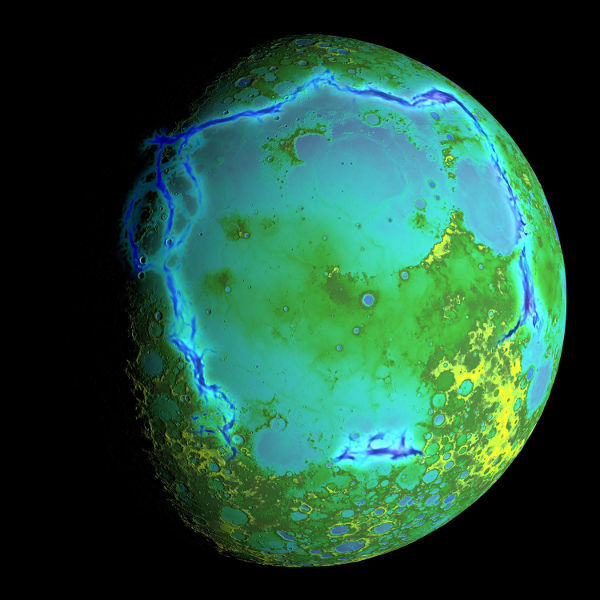 This topographical view uses data collected by the Lunar Orbiter Laser Altimeter and shows the gravitational anomalies bordering the Procellarum region (in blue). Scientists interpret these anomalies in lunar gravity as likely resulting from ancient lava-flooded rift zones buried beneath volcanic plains on the Moon. It looked like a spotlight shining down on us from the night sky. Over this past weekend, the moon was closest to the Earth and visibly brighter and larger when viewed through the naked eye. This picture was taken in the city of Toronto and even though there are many better pictures of the supermoon from this past weekend, it does show the full moon. A telephoto lens was definitely called for! 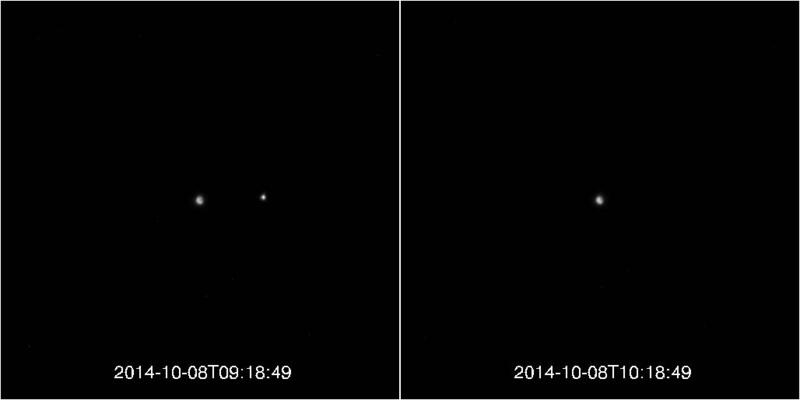 NASA’s Mars Reconnaissance Orbiter (MRO) looked back and took this picture of the Earth and Moon from Mars, using its High Resolution Imaging Science Experiment (HiRISE) camera. Taken from approximately 142 million miles (88 million km) away, one can barely make out the west coast of South America in the lower right hand portion of the partial Earth image.